On 24 October 2018, under the title: Ministry of Justice followed all the recommendations of Venice Commission, the Ministry of Justice in Serbian Government published “New Report of the Venice Commission” and explained that the Members of the Venice Commission, during the Commission’s 116th Plenary Session, discussed the fourth Draft of the Constitutional Amendments of Serbia. The Ministry’s press release claimed that the Venice Commission concluded that latest version of amendments followed Venice Commission’s recommendations formulated in its Opinion (CDL-AD (2018)015) from June 22-23, 2018. The document Ministry is referring to is available on website of the Ministry, in English and Serbian language. This document, entitled “Secretariat Memorandum on the compatibility of The draft Amendments to the Constitutional Provisions on the Judiciary” shows that Venice Commission’s Secretariat provided a summary conclusion about compatibility of the latest version of the constitutional amendments with previous Commission’s recommendations. Report from the 116th Plenary Session of the Venice Commission, available on Commission’s website shows that members of the Venice Commission did not decide upon compatibility of the latest version of the constitutional amendments with previous Commission’s recommendations. Member of the Commission were informed on follow up to the Opinion on the draft amendments to the constitutional provisions on the judiciary of Serbia and took note of the Secretariat Memorandum on the compatibility of the revised draft Amendments to the Constitutional Provisions on the Judiciary with this opinion. Rules of the Procedure adopted by the Venice Commission entitle Commission’s Secretariat to serve under the authority of the Commission, receive information on associate members and observers in Commission’s sessions, executes administrative tasks in appointment and term of Commission’s members, drafts agenda for Commission’s Sessions, preparing and circulating all the documents intended to be examined by the Commission and take care of the language usage in Commission’s work and materials. 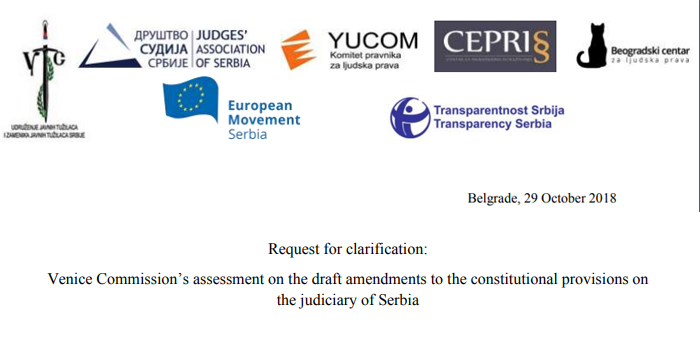 Why Venice Commission in the case of assessment on the draft amendments to the constitutional provisions on the judiciary of Serbia did not follow regular or urgent procedure in adopting opinions, prescribed by the Rules of procedure of the Commission (which prescribes the need of nominating the rapporteur(s) or working group). Memorandum in paragraph 10, commenting on composition of the High Judicial Council and the role of the National Assembly, concludes that fourth acceptable option for the Commission in the composition of the HJC was to increase the majority requirement and to enable the five-member commission to choose from among the candidates who originally applied with the National Assembly for the membership in the HJC. In paragraph 11 of the Memorandum we find conclusion that “second round has been taken out, but the text kept the commission as an anti-deadlock mechanism and is in line with the recommendations made by the Venice Commission”.Here we point that in the latest version of amendments, Amendment XIV prescribes that, if National Assembly does not elect all the five members within the stipulated deadline, the remaining members, shall be elected (by specially formed five member commission) from among the candidates who meet the criteria for election. This means that additional selection of the candidates who meet criteria for election will precede the elections, and the commission will not decide among all the candidates who originally applied, as Venice commission proposed in its Opinion (CDL-AD (2018)015). This is specially worrying if we add other two circumstances: the vagueness of the criteria for elections (such as ten years of “relevant working experience”, “demonstrated professional work” and “good personal reputation”) and the fact that the Amendments do not prescribe who will decide upon candidates’ fulfilling the proposed criteria. The same remark can be applied to paragraphs 12 and 13 of the Memorandum (Composition of the High Prosecutorial Council and the role of the National Assembly) and the Amendment XXVII of the latest draft amendments. Memorandum of the Secretariat treats some of the previous Commission’s recommendation inconsistently. For example, in paragraph 25 of the Memorandum, referring to the criteria for election of prominent lawyers, the Secretariat supports that the amendments no longer list Bar exam and the vague criteria of “working experience in the field of law falling within the competence of the High Judicial Council” and replacing it with “relevant working experience as defined by law”. Similar, in Memorandum’s Paragraph 32. In its Opinion (CDL-AD (2018)015), referring on prohibition to judges and court presidents from engaging in political actions, Venice Commission recommended that “political action” needs to be more clearly defined or replaced by introducing a prohibition of membership in a political party. In Secretariat’s conclusion as positive was evaluated replacement of “political action” with “the law shall stipulate which functions, activities or private interests are incompatible with the function of a public prosecutor or deputy public prosecutor.” In both cases Secretariat concludes this changes are in line with the Venice Commission’s recommendation, although the new solutions are not only vague, but completely unknown and left to future regulation. In paragraphs 28 and 29 of the Memorandum, the Secretariat concluded that recommendation of the Venice Commission on Judicial Academy’s protection from possible undue influence has been followed by introducing separate article on Academy’s firm status within the Constitution, as an autonomous institution. In the latest version of amendments, Amendment XXXI on Judicial Academy was added, but this proposed article does not protect Academy from undue influence, having in mind that the Academy is enshrined as autonomous, and not as independent institution in order to enable the appointment of independent individuals on judges and public prosecutors office, and leaving the position and organization of the Judicial Academy to the future regulation (“The position, organization and activities of the Judicial Academy shall be regulated by law”). The Amendment XXXI also envisaged that management body of the Academy will reflect the composition of High Judicial Council and High Prosecutorial council. According to the relevant amendments, this will mean that proportion of members appointed by the National assembly and members appointed by the judges and prosecutors will be 11 to 9 in favor of National Assembly and Government representatives, securing the political influence on entry to judiciary system. We also note that the Memorandum of the Secretariat did not analyse other very significant issues tackled by Opinion (CDL-AD (2018)015). Not exhausting all of those important issues, some of them are – likability for half of the members of the HJC, HPC and Supreme Public Prosecutor to be elected by only three votes (majority vote of the five-member Commission whose members are elected by simple majority in National Assembly); the obligation of cessation of the term of all HJC and HPC members in the case the decision is not made within the 60 days, the role of the President of the National Assembly in cessation of the term of the HJC and HPC members and open list of reasons for mandate cessation (“other matters prescribed by law”); continuous denial of right to membership in HPC to public prosecutors; vagueness of definition of status of case law (“A judge shall be independent and shall rule…taking into account the case law”, “The Supreme Court of Serbia shall ensure uniform application of the law by the courts through the case law”) and abolition of guarantee for non-referral of judges within the judicial system and the legal remedy of a judge against the decisions of High Judicial Council (aside against the decision on cessation of judicial tenure and on relocation). We consider all untacked issues serious and significant enough to be analysed and evaluated, since they were covered by Opinion (CDL-AD (2018)015) and will be crucial to future implementation to the judiciary of Serbia. Once more we remind the Venice Commission that Serbia formally did not initiate revision of the Constitution, which increases chances for misuse of any Commission’s opinion on texts delivered before constitutional revision was initiated in the National Assembly of Serbia. Under article 203 of the Serbian Constitution, National Assembly of Serbia is the only body entitled to draft proposal for constitutional change. Responses to the questions asked and notification of omissions made in the Secretariat’s Memorandum will be very significant in continuation of the constitutional reform in Serbia, especially having in mind Venice Commission’s high reputation and authority in the Serbian public.